Laura Eaton-Lewis explains how Westminster has literally sold the ground from under your feet. Ye’ll have had yer Democracy, then? Oh Edinburgh. It was all looking so good for you for a while. Your high property prices, your comfortable financial services, your beautiful scenery, your controversial masonry, and now… this. For various reasons, this good people of this city put its trust in London to make decisions for us. They voted not to take our own decisions here in Scotland. Oh, but would they have seen one little map, they might have felt a little differently about that. This little map from the Crown Office with the big red circle right around the whole of the centre of Scotland, shows exactly where the UK government are currently selling off licenses to energy companies to drill under your homes to get at that pesky gas and oil trapped in the shale down below. This is not some remote desert in America, this is where 80% of Scotland’s population live, under our homes, in Glasgow (Yes) and Falkirk (Yes) and Fife (No! ), and Edinburgh (NO!!). Our fair countryside, our honest touns, our historic cities… the entirety of Scotland including, dear old Edinburgh is fair game for fracking. Westminster has literally sold the ground from under your feet. Soon, an energy company is going to start drilling underneath your own home, with a likelihood of causing earthquakes, poisoned water supplies and subsidence. And there we were being worried about our mortgages going up! No need to worry about that, because you’ll be too busy worrying whether you’ll lose the entire value of your home, as happened in Lancashire. Thinking about being comfortable in your old age? Well, you’ll have more to worry with cracks appearing in your home and your tenement falling down. Since our drinking water is about to be contaminated with carcinogenic chemicals, might be a bit pressing to worry about that, mightn’t it? But hang ON. How on earth has this happened and why didn’t we know about it before? Last year, some of us had cottoned on that there were plans afoot and we duly added ourselves to the Greenpeace register with our postcodes and addresses to state that legally we denied permission to ever frack under our homes. That should have done it, right? We said no… we didn’t want this to happen. But that didn’t suit the government, who don’t seem to mind that the UK is one of the most densely populated places in the world. Evidently, there’s money to be made and if the public lose their money and their wellbeing, well, that’s hardly the government’s problem, is it? We voted for them after all. So by stealth and without a single vote being cast, the Tories pushed a piece of legislation through the back door of Westminster’s ironically named ‘Department of Energy and Climate Change’, on 20 December 2013 when all MPs had gone home on holiday. Four government ministers decided to make it unnecessary for drilling companies to seek the permission of every householder before drilling under their home and their land. According to Nick Boles MP (Lib Dem), notifying every homeowner was ‘unnecessarily excessive’. This was ratified on January 13 2014 when they’d received no objections from MPs, presumably because they were too busy nursing their new year hangovers to catch up on parliamentary business. Now, no MPs objected, but they had received 155 objections (only 7 in favour) during the hasty piece of public consultation they’d done six weeks prior. Strangely none of those objections made any impact on their self-ratified decision. At this juncture over 45,000 legal oppositions to block energy companies from drilling became useless, as they no longer needed to notify you and no longer even needed your permission. As have (PEDL 161, 163) which is the whole of central Fife, and that lovely bit of coastline from Anstruther to Elie to right the way inland. Much of the rest of Scotland is up for sale right now. Including that area under Leith and Portobello where much of the town is built on old mines, sand and shale, where there is already subsidence. Including Edinburgh’s grand New Town, The Grange, Bonaly, Colinton, Morningside, Merchiston, even the Scottish Parliament itself. Maybe we will be needing that power back then. Faced with a Government and an opposition who are quite willing to sell us out from under our feet, from under our own laws, where else are we to turn? There is no democracy here, there is nothing to see. We could take heart from the Unis’to’ten people, who have set up camp on their land in Canada and every day provide a ‘soft’ blockade putting their bodies in the way of the advancement of the petrochemical companies and their drills. This might be the only hope. It appears that the law wasn’t enough to stop the government once they’d set their eyes on this prize, and we know well from experience there is little hope from signing petitions or marching. In a week where we’ve been sent to war, watched the ‘vow’ dissolve in front of us, witnessed promises to raise the pension age to 70 and cut child benefit; we have also seen David Cameron turn the ‘Scottish question’ into the ‘English question’, a proposal which would mean a two tier Westminster in which the opposition was effectively annihilated forever, democracy is very thin on the ground indeed. In the face of this assault on civil liberty, the Scottish Parliament must demand the power over fracking, and even though the licenses have already been sold, we must stand our ground and assert again, our ownership over our own ground. and UKIP has the cheek to tell Scotland not to bully England. Luckily comments like that will do them no good and only galvanise the Yes campaign. Since the ‘Referendum’ was clearly rigged and stolen, with “Yes” votes found in “No” piles, in the trash, etc. one would think the Scottish people should make sure that not a drop of their oil or a centimeter of gas is ever delivered to further the murderous aims of the Westminster monsters. Manyof you seem to have come into this argument very late in the day. Concerned,informed Scots have for years been aware of this issue…..and have had very little encouragement from the Scottish Government until now.Indeed,a year or two ago Salmond was talking about the “great potential” fracking offered Scotland’s economy and fuel self sufficiency.Unfortunately for us in Scotland,the geological facts are clear.Most of our shale oil potential wealth lies under our most densely populated areas…..and no change of government will alter those facts. Then you have to make a choice. People or greed- end of! Where is the media now? We need to write to every newspaper and ask them why they are not concerned about reporting this. Of course, they are awaiting their peerages due to their biased referendum campaign. There is no media Ellen, just propaganda. The brave reporters and editors of old are gone and in their place are cowards and corrupt multinationalists and of course in potlitics, “tow’rs of the party line”. I wonder what interests those Ministers have in energy companies? I wouldn’t be surprised if they have a handful of directorships and a few hundred thousand pounds’ worth of shares among them. George Osborne’s father has interests in fracking company Cuadrilla. They almost certainly have.However….planning is a devolved matter,and any company that wants to undertake fracking in Scotland will still have to apply for permission under Scottish planning and environmental regulations/laws….and obtain the necessary permits. May I suggest that it would certainly be more fruitful to ensure that our local government agencies/councils and ourMSPs are aware of our opposition.Since the SNP are a majority….this should help. Planning is a devolved area so I don’t understand why the Scottish Government cannot just amend planning statute to outlaw fracking in inhabited areas? I think it must be the case that the devolution of planning is really limited? Administrative and not having the legislative ability to change primary legislation? I understand that the Scottish Government has sought to delay fracking by insisting on an environmental assessment first. This will be carried out by SEPA. Not only are SEPA pretty useless, but it means the public will be paying for this, as SEPA is a public body, unless the SG is able to insist the fracking companies covering this charge. But how on earth will SEPA know what to look for? It could be many years before damage caused by fracking shows up. So how can SEPA feasibly assess this? This cannot be true…there is no mention of it in the mass media. Yeah. Just watch them back off when we wave our Saltire’s at them. A valid point, Deewal. At 9pm on 19th September, I took a walk down to Holyrood expecting to see tens of thousands of angry people uniting in disgust at how the British establishment had robbed us of independence (rumours of vote rigging had already surfaced too). I met 8 people there outside the Parliament. That was it. All standing and asking the same question I asked (“Where the hell is everyone?”). Okay, nothing had been organised, but should it have to be? So the question needs asking – when democracy fails (as it felt to many on the 19th that it had), what then? If 99% of the population say they don’t want fracking, but the UK government goes ahead with it in Scotland anyway, what’s to be done? Good that it gets a mention. I’m searching the BBC’s online news and can’t see it there though. Maybe it’s not that important. But they do say the Sunday Post is celebrating it’s 100th year. That joy should quell any civil unrest. Jings. If this goes ahead I suspect it’ll take more than a cuff round the ear from PC Murdoch to prevent civil mass disobedience directed against the fracking companies. Anybody think that it’s strange that they talk about knowledge and not consent ? Interesting point, Mic. But I’m still jumping up and down at the news about the Sunday Post, so I don’t really know. Here it was. See all the comments completely mocking the idea that this is even an issue… These people are beyond the pale. Thanks, MBC. Yeah the comments are interesting. I can imagine a few are straight out of GCHQ. And I wonder if we shall recognise any of the names of those applying for the licenses…. I hear Ian Wood (The Wood group) has been awarded a fracking licence. The Wood Group’s timeline looks very interesting. Buy into American fracking company. Within months does a reverse on his own report, now claiming there are only 14billion barrels left in North Sea. Next day, Wood group financials released for current year. Fracking in USA going well, big profits. Traditional industry of servicing oil infrastructure in Aberdeen, making big losses. And now they’ve suddenly been awarded a fracking licence. So, the question we are left with, would it be useful for the Wood Group to play down an industry in which they are losing money (oil) and play up the area in which their profits are rocketing (fracking) ? Course it helps them. What a scheming sod. Do you know the name of the USA Fracking Company? I would like to follow this up with a few friends over the pond. Yes, the name of the company is ‘Elkhorn Holdings’ based in Wyoming. It doesn’t look like Wood Group received a license at all and there’s nothing online to substantiate it. The Twitter rants that continued over the weekend don’t confirm anything. The Eikhorn Holdings purchase was pretty well documented last year and it looks like there’s confusion between their involvement in “fracking” Stateside, the current uproar here in Scotland and the level of “Wood hate” doing the rounds. It’s fairly easy to see how this could be misunderstood. That said; i wrote Wood Group late friday to confirm this but as yet have received no reply. Where did you hear about the fracking license? It’s troubling that several days after the false Wood Group “fracking” license claims first appeared online that it’s still being accepted as gospel by so many. Tartanfever’s entire point relies upon this nonsense. Once more; can you tell me where you heard about Wood Group having “suddenly been awarded” a fracking license? if i’m in the wrong i’d like to know. I’ve been looking for details on this license having been granted to Wood Group, but can find noting to substantiate it. Ineos has bought 515 of the available licenses, but no other company has as far as I’m aware. What is your source please? I’ve been looking for details on this license having been granted to Wood Group, but can find noting to substantiate it. Ineos has bought 51% of the available licenses, but no other company has as far as I’m aware. What is your source please? There is no “source” Steve. Absolutely nothing. Which calls into question the credibility of TartanFever’s initial response and indeed anything else he’s written on the matter. If he was foolish enough to quote the first Tweet he read on a subject so well documented without at least checking the facts then frankly he shouldn’t be passing comment on the issue at all. The Eikhorn purchase has been in the public domain for over a year. A Stateside, onshore business. Nothing to do with the current fracking debate here in Scotland. Where did you get the information on Jan Woods involvement with the fracking license. Want to read this! Denise; there is no information on Woods involvement with the fracking license – that’s the problem. This “story” probably came from a number of incorrect “tweets” wrongly linking the Wood Group purchase of Eikhorn Holdings over in the States (late last year) with the INEOS (Grangemouth) license award and without checking that information it became “fact” here at Bella Caledonia. Tartan Fever’s post should have been corrected weeks ago or removed entirely. It doesn’t seem a very Conservative stance to transfer private property rights from one person to another without compensation. Did Better Together draw the red lines on the map? It seems to be only SNP constituencies that are affected. There is not a sniff of shale gas in the Borders. But if the SNP win down there the UK govt will declare the area the fracking Saudi Arabia. Maybe a timely reminder of the new Hinkley Point C nuclear power station and who owned the land. Really ? £50 million for 230 acres ? Thats, at minimum, over-valued by 10 times. ’85, same year Willie MacRae was murdered. “The twentieth century taught us the vital role of representative and accountable governments in offering their people opportunity, hope and dignity. Governments that only govern for some of their people cause deep resentment”. He attacked “the peddling of lies”: “The idea that Muslims are persecuted all over the world as a deliberate act of Western policy.”. So the bogus “war on terror” had nothing to do with grabbing Afghan heroin or Iraqi oil – or disabling any Muslim state that Israel perceived as ‘unfriendly’. Muslims became the new ennemi du jour in the early 1990s to replace the loss of the Soviet Union as the enemy required by the arms industries and militaries of the West to keep so-called ‘defence’ spending at record levels. It was actually the FBI-assisted first World Trade Centre bombing in1993 that launched the new “war on Muslim terror” under Clinton, long before the second, internally assisted, attacks of 2001. Yes but only allowed if your one of them, if it had been our land it would be compulsory purchase at half the market rate. On another note how did it take better than 40 years to get the east bound link from the M9 to the Forth Road Bridge? The Court of Session’s fundamental constitutional role is to protect the people of Scotland from abuse of power given by the sovereign people of Scotland to the crown or politicians by maintaining the ‘Laws and Constitutional practices’ of Scotland. [from tart advertiser] have they ever done anything for the people of Scotland. The common law of Scotland states that owners of a parcel of land (your house, for instance) own what is under the ground to the centre of the earth. But I don’t suppose they’ll do anything about it. I would have thought Hopetoun House would be up in arms though. If we didn’t know it before, the Scottish people now know just how important politics is. Make the wrong choice, and you get what we’re experiencing now. Our airforce sent to war (or at least to drop bombs), pension age brought ever closer to death age, more of our kids sent to bed with an empty stomach, government promises put through the shredder, and our natural world on the brink of disaster. Just imagine if we’d chosen independence 9 days ago. That’s all it came down to, a choice. How different the world would look right now. If Alex Salmond looked like George Clooney, we’d have got a Yes majority. If the No voters had been promised that we’d be taking Coronation Street with us as part of our share of UK assets, we’d have got a Yes majority. That’s the state of the world today, unfortunately. It doesn’t matter how low our wages drop, just as long as Primark can drop their price for a pair of jeans from 6 pounds to 4. Just keep the lights on long enough for us to catch half an hour of Coronation Street, that’s all we need. In Norway, they don’t know what Primark or Coronation Street are. They don’t know what real living is! Okay I’m going to bed now. No I was pointing to those who accept their lot – and they’re ALL on the No side. If it helps, let me switch Primark for Next or Gant, then. My point works the same way I think. Shopping just another addiction for the masses. No different from the other addictions that are destroying our well being. Don’t count on the Scottish Greens for any campaigning, not if they’re anything like their Anglo-Welsh counterparts. The British government is hell-bent on turning England into one mass of concrete and steel, but the Greens have said and done the square root of naff all abut protecting England’s green belt and countryside from destruction. You’d think such concerns would be right up their party’s alley. Caroline Lucas got arrested for protesting against fracking. There’s a petition up on Change.org. Oh look, it’s an online petition. Not very constructive I know but I can hardly wait to hear those no voters start to bleat and squeal. On Radio Scotland’s ‘Morning Call’ on Friday, a Mr. Graham Dean (a Scot) was introduced, not once but four times, as “an engineer who works in the shale gas industry”. Mr. Dean gave his expert views (which were based purely on his technical expertise) in the discussion, and claimed that “..most people are in favour of fracking..” despite a recent UK government survey finding that 99% of the population is against fracking. The engineer also said “there is not a lot of water used in fracking, that’s another myth.” The engineer was very adamant about that, despite the recent publication of a mythological study by the Canadian Center for Policy Alternatives which stated, “Oil and gas wells may be fracked up to 17 times, with each injection utilizing as much as 18 million litres of water”. It seems petty to even mention this, because it really is nothing, but – just by some coincidence – the Managing Director of the fracking company Reach CSG Ltd. is also called Graham Dean (he’s also a Scot). If there weren’t thousands of Scots engineers called Graham Dean already working in the fracking industry, I might be highly suspicious of the BBC’s guest engineer on ‘Morning Call’. I knew about that one, and I think it is for under the land that their petrochemical works and oil refinery are on… it crossed my mind that this purchase might be defensive? That they bought those rights so as to prevent others from fracking there? At any rate it will be interesting to see if they do frack underneath the refinery and petrochemical works. Jim Ratcliffe is no fool. They do a number of promotional videos. On one of them he revealed that his biggest fear is safety. In the industry he is in safety is of paramount importance. See the legal penalties hurled at BP for the Gulf of Mexico incident. If Ratcliffe decides to frack underneath his refinery and petrochemical works then I will believe that fracking may indeed be safe. “We know you’re not particularly interested in social equality or improving the environment, but did you know that a great swathe of the Central Belt of Scotland is being earmarked for fracking? And there’s the distinct possibility that even the threat of this could cut your property values by up to 80%? And that the reality could mean compulsory purchase orders and leave land unfit to rebuild on? And that with independence you can stop it? Tell you what, the Nos will be up in arms if their house prices collapse on the back of fracking, and all because they voted for their beloved dependency. As it happens, I did a lot of campaigning after my newborn son was old enough to be left alone for an hour so I could write some of the articles that are on this website, and speak at some rallies. SNP knew more about this and I did, why didn’t THEY campaign more on the issue? That’s the question you should be asking. Here you go, Shuggy, this link was posted in the comments of my own blog by some eagle eyed observer. Proof that the SNP knew that fracking was a big issue. Probably didn’t want to use it in the campaign because they hadn’t backed Alison Johnstone’s call for a 2km exclusion zone around communities. SNP fail, not my fail. Pleased to see this hasn’t gone unnoticed. The SNP’s stance on this issue is at best weak having voted against a moratorium which would have delayed any further development until “restoration funds” were put in place. Very poor indeed and hardly the “totally opposed to it” “100% ban” attitude being put about by the ill-informed SNP grassroots Twittersphere. Ridiculous. Right.They didn’t use it because they were thinking of undermining the most populous areas of Scotland for the benefit of an independent Scotland….and were hedging their bets. Independence would not have changed the geology…and if you frack,then you have to frack where the fracking stuff is…not where it isn’t. I was commenting on your piece. Odd, both of your replies to my comment refer to the SNP’s stance, not your own – and, of course, to your childcare arrangements. Well done you (again). No, the question I am clearly asking is why YOU did not seek to share the information to which you and your chums had sufficient advance access in to enable you to take action in your own best interests, instead preferring to write this piece a whole nine days after the vote, sneering at those who may be affected, like some backstreet magician pulling a bit of mangled roadkill out of the battered top hat of the referendum with a loud ta-DAH before chucking it all over the people who voted No. It reeks of “See, told you so”. Except of course, you didn’t. Yep. Maybe our education system isn’t the best in the world after all. Middle class Edinburgh isn’t going to care. They’re not going to start fracking under the New Town. The UK middle class want to keep us as a nice back drop for the nice festival they have, and they’ll make sure their lovely houses won’t be in any danger. For all I know they’re got shares in the companies doing the fracking. The working class in Scotland and elsewhere in the UK will be up against it with the fracking companies and doing what we always have to do – organising against organised capital. Well said Julie,Auld reekie won’t be bothered as they are only on the map as a smoke screen to pretend non bias of area. Apologies for not reading through all the responses to this information and my point may have been raised already. 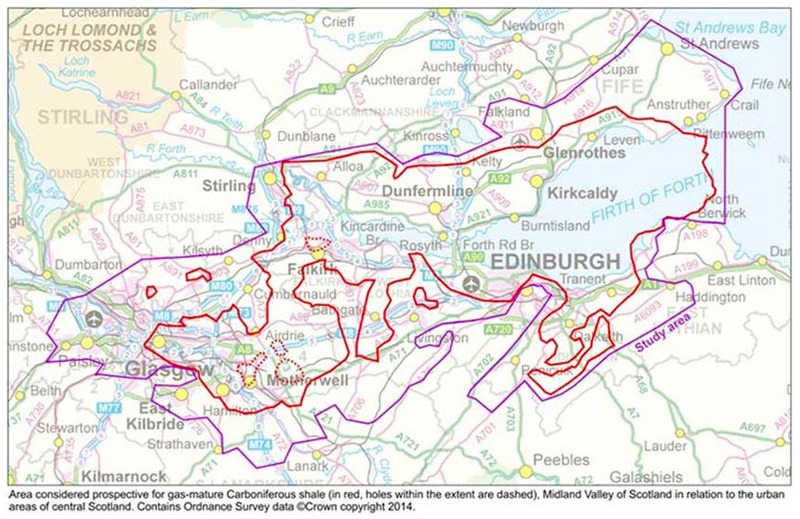 However, that outline of possible fracking sites around Edinburgh and the Lothians will come as no surprise to anyone that has some history of the area, or has basic Geology knowledge. The site has been used for various resource needs for many years. The area chosen would be a no brainer for fracking purposes. This is not a pro/anti independence issue, it is the future of resource stripping whether we agree with it or not. This is not a class war either, as we are all to blame for the position we are now in as we are draining the resources the planet has at an alarming rate with little care for the knock on effect. Quite. Shale was mined underneath what is now Portobello and Joppa, and we know most of Fife and West Lothian too. Plenty ignorance spouted here. The SNP are not discounting fracking, vote Green and start behaving yerselves. Ye vote green and fill our beautiful country with horrible windmills that requires another source of power when the winds doesn’t blow – madness.. I doubt it is ignorance, more like lies. The motto of the paper is “Great is the truth, and it will prevail”. In my experience only liars have to tell you they speak the truth! To all those wonderful “Northern British” who voted NO. Well done, hope your happy. Using (new) ‘law’ to bypass humans rights, sheer force to fracture the actual ground those ‘other’ humans stand on and withdraw wealth for a preferable purpose….Sound familiar? Except it’s not in the Middle East anymore is it? Well they didn’t take our guns for no reason??????? As an aside: perhaps it’s a time for a name change. SNP was (deliberately) confused with the “Nationalist” BNP by the No Campaigners south of the border. Suggest Scottish Independance Party because we all like a wee SIP now and again. Someone here made a good point here. Why wasn’t the SNP more vocal about legislation? Fergus Ewing is trying to get control of fracking brought back to Scotland. Why not get behind the SNP, at least until after independence? The SNP is the bullhorn we all need if we’re to get independence. Can we act? Yes. Support your Scottish Government. Support the SNP. Don’t agree with their policies? Vote Green or join the SNP. As a party member you can vote for change. Every new party member strengthens the SNP in the devolution process. Scotland’s Energy Minister Fergus Ewing officially objected to the proposals and has condemned the decision, and has called for the key powers relating to this issue to be devolved to Scotland as part of the current devolution process. This would allow unconventional oil and gas exploration in Scotland to be considered in a cautious, considered and evidence-based way, as opposed to the “gung-ho” approach of the UK Government. They have sucked the guts out of scotland now theyre sucking veins .. I work in the oil and Gas industry and have 3 years experience of shale gas exploration here in the UK as well as Poland, Ukraine, Portugal and France. This article is very misleading, as the author is suggesting that during the Frac stage of development the Frac fluids will enter domestic water well formations! This, like so many other scare stories make the same major omission – ground water boreholes used to supply domestic water are typically 30-100ft deep, they can be as much as 900 ft deep, but this is the limit as the further Down you drill for water, the more scale and minerals are in it and the higher cost of filtration…not a good idea. Most shale being explored in the world is found around 13,000 – 15,000 ft!! There is no chance of contamination, especially due to the fact that the well at this stage has been completed with cement and casing. All pressures and fluids are local to the formation (imagine sticking a drinking straw into a bowl of set jelly, then blowing gently down the straw, a bubble will form – this is a basic representation) in question and once the well is brought on to production, the vast najority of fluid (not solids such as Frac sand) is recovered to surface! Shale gas and fracturing causes no adverse affect to your home, environment or drinking water! why dont you read the infrastructure bill which was introduced to the house of lords by baroness kramer..[lib/dem] and if you read hansards text covering the discussions to the amendments 22nd july you will find that the one person who tried to safeguards scotlands interests was the duke of montrose – to no avail as the scottish government had already [this is july] conceded that this could be considered a reserved matter rather than a devolved one. the Duke of Montrose is a conservative by the way. if you want to investigate further try geoffrey woods report for background info, and maybe check up on the scottish goverment website, reserved matters/electricity/environment and planning…exceptions are interesting. The vast majority of debate going on now, as in the recent past, seems to me to be a great deal of noise over what people think is happening as opposed to talking about what actually is going on. People both sides of the border have no chance of changing things, or making their voices heard, if all they rely on is ‘what someone somewhere says or writes’ and i include myself – im not an expert, read it for yourself, not the newspapers or someones blog. If you want to complain about government and ministers wouldnt it be more sensible to actually go straight to source..ie parliamentary process. I cant find any bill as suggested in original story re dcc on 20th december 2013 so i would be grateful if whoever has that could actually post the piece of legislation…that is the act in question? Whatever the SNPs policy on fracking has been in the past they now know how the people feel about it, if necessary all the new members can vote in new policies. Russia supplies 15% of the UK’s gas – I expect Mr Putin will mess around in the winter with that gas supply – as such we will have no option but to secure a gas supply which will mean we will have no option but to FRAQ to secure that supply.